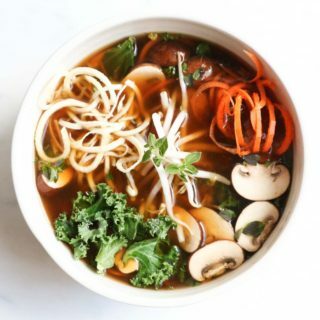 Detoxifying broth bowls with parsnip and carrot noodles is a paleo and gluten-free meal that is chocked full of anti-inflammatory, nutrient dense veggies. Healthy, quick, and super yummy! In a saucepan over medium heat combine bone broth, turmeric, and mushrooms. Cook for 4 minutes or until mushrooms have softened. Add kale, parsnip noodles, and carrot noodles. Cook for 3 more minutes. Turn off heat and stir in coconut aminos. Pour into a bowl and top with bean sprouts and fresh oregano. You can add or sub any veggies you like. I love spiralizing a variety of root vegetables.